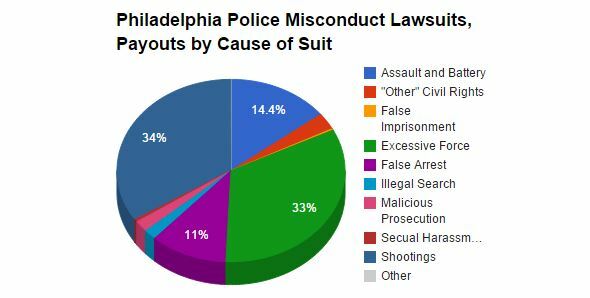 The number of police misconduct lawsuits successfully brought against the Philadelphia Police Department since 2009 is among the highest in the nation, according to recent data obtained by Boston Globe and MuckRock News contributor Todd Feathers. Over $40 million in settlements have been paid out to plaintiffs during Police Commissioner Charles H. Ramsey’s tenure as Mayor Michael Nutter’s police chief. Of those settlements, the majority are for assault and battery, with excessive force a very close second. According to MuckRock News, the two highest misconduct settlements stem from the officer-involved shootings of Stephen Moore and Jamil Moses – both of which settled for $2.5 million each. The numbers dwarf comparable statistics in other major cities for which MuckRock obtained the same data. For example, the cities of Indianapolis, San Francisco, San Jose, and Austin settled or lost a combined 122 police misconduct cases – compared to 586 cases in Philadelphia. As of the 2010 census, those four cities had a combined population more than double Philadelphia’s estimated 1,526,006 residents. Read Todd Feathers’ full story, “Police Misconduct by the Numbers”, at MuckRock News.